The cast of “ModRock.” Photo by Michael Lamont. “I remember February 9, 1964, like it was yesterday,” says Tom Coleman, producer of ModRock, which opens Sunday at El Portal Theatre. “The Beatles appeared on [The] Ed Sullivan [Show] and the world changed overnight.” Coleman is referring to the British Invasion, when mid-’60s UK music and culture captured the imaginations of young people across America. One of those teenagers was Coleman — who, many years later, decided to write and produce a jukebox musical about the period. Similar to the stories of the Capulets and the Montagues or the Sharks and the Jets, the show spotlights lovers from rival factions: the Mods and the Rockers. 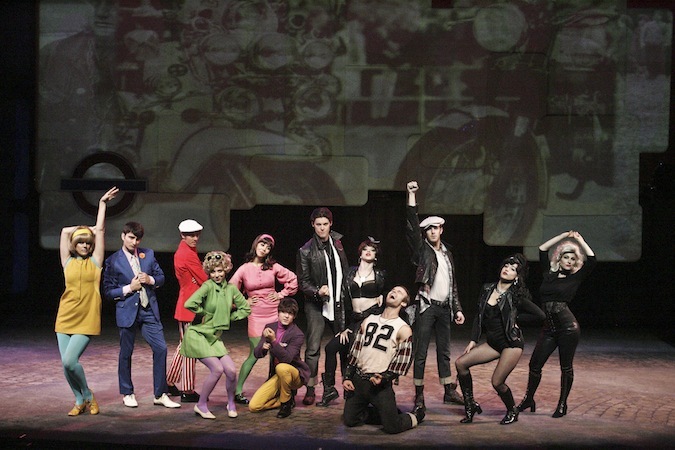 Set in 1965 London, this culture clash of fashion, music and style is the vibrant backdrop of ModRock, which makes 20 classic songs from the era, the trends of the day and even motorcycles and scooters central pieces of the production.